In this guide, we will show you how to evolve Eevee into the Eeveelution you want. 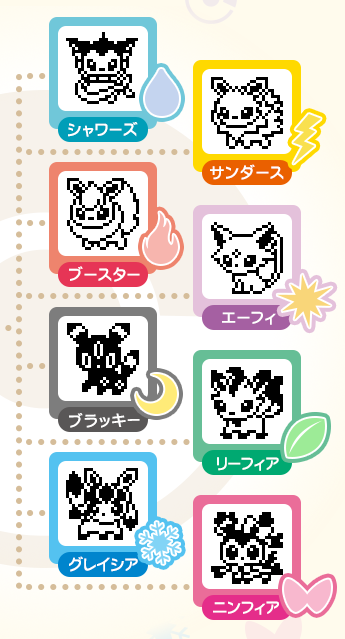 If you just started playing Eevee X Tamagotchi, be sure to check out our basic instructions and English translation guide first. 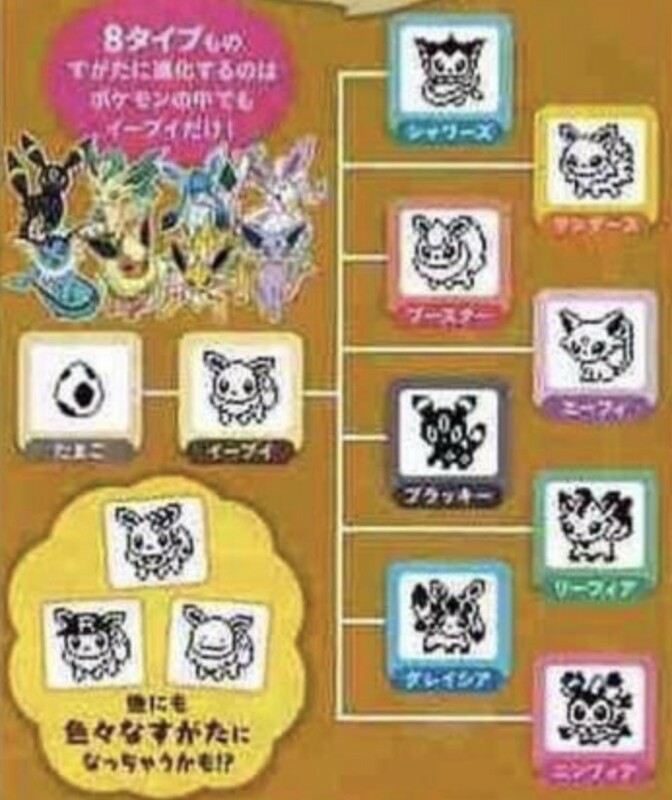 Evolving Eevee into any of the members of the Eeveelution family (with the exception of Espeon, Umbreon, and Sylveon) is the easiest in Eevee X Tamagotchi. In the Kinomi Get mini game where you have to catch Kinomi, instead of catching the Kinomi you grab the Evolution Stone (the obstacle) of your choice. See the picture above for the corresponding Evolution Stone. The last Evolution Stone received becomes Eevee’s evolution in three days. Don’t forget to regularly feed Eevee food, snacks, and play with it. To evolve Eevee into Espeon, you should try to feed it as many snacks as possible in the morning between 7am and 11:59am. To evolve Eevee into Umbreon, feed it lots of snacks in the evening between 6pm and 7:59pm. Thanks to Jack and Laura for the heads up. Thanks to Nixnox for the updated method of evolution. Evolving Eevee into Sylveon, the Fairy-type Pokemon, occurs when you don’t catch an Evolution Stone in the Kinomi Get mini game but it still receives regular attention. So make sure you feed it food, snacks, and play with it. Thanks to Nixnox for the updated method. Getting Pop Star Eevee is very simple – simply keep playing the Dancing Game (meaning you don’t play Kinomi Get) and aim for a perfect score every time you play it. To evolve Eevee into Team Rocket Eevee, you have to achieve Bad Care for Eevee when it’s awake for two to three days. Do this by missing Eevee’s cries whenever it’s hungry or wants to play with you. Of course, make sure it’s fed with Poke Food (meal) at least once or twice a day or else it will return to its Poke Ball (death). Feed it snacks, but don’t play any games. To evolve Eevee into Ditto Eevee, you have to achieve Bad Care for Eevee when it’s awake for two to three days. Do this by missing Eevee’s cries whenever it’s hungry or wants to play with you. Of course, make sure it’s fed with Poke Food (meal) at least once or twice a day or else it will return to its Poke Ball (death). Don’t give it any snacks and don’t play any games. And that comes to the end of our guide! If you’re interested in reading more Eevee X Tamagotchi guides, visit our guide page here. 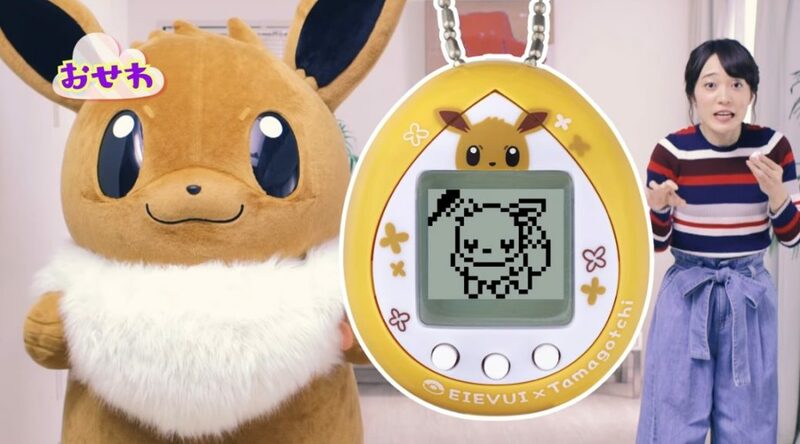 NintendoSoup Store is also offering Eevee X Tamagotchi, in case you haven’t bought yours.